Ultima Sports Ltd. are a sports car manufacturer currently based in Hinckley, Leicestershire, England. Founded in 1992 by Ted Marlow and Richard Marlow, Ultima Sports Ltd manufacture and distribute worldwide the Ultima Evolution supercar. The current Evolution is available in two body styles: coupe and convertible. The Ultima Evolution Coupe and Ultima Evolution Convertible have body styles unchanged from the preceding Ultima GTR and Ultima Can-Am models respectively. Prior to the GTR and Can-Am models, the two models produced were the Ultima Sport and Ultima Spyder. All models in the Ultima range have always been primarily supplied in component form. That is Ultima produce the parts required for an owner/builder to construct the car off-site, and this is the only way to receive such a vehicle in the USA (including a 'rolling body' fully constructed minus engine and transmission). However cars are also manufactured onsite as "turnkey" models for the European market. The preferred engine supplier for Ultima are currently American Speed, a company who specialise in re-engineering Chevrolet V8s for increased performance. 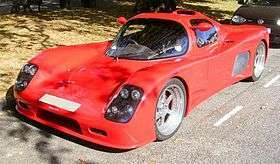 It was with a 640 hp (480 kW) version of the Chevrolet small-block V8 built by American Speed, that company director Richard Marlow was able to set a number of performance records in an Ultima GTR during 2005, this combination was known as the Ultima GTR640. The latest Evolution variant is being marketed with an American Speed 1,020 hp (760 kW) motor as the most powerful available from the factory. In 2006 Ultima beat their own 0-100 mph-0 record set in the GTR640 with the GTR720, again using an American Speed SBC engine but now with 720 hp (540 kW). The new record shaved 0.4 seconds off the time completing 0-100-0 mph in 9.4 seconds, a new world record for a production road car with street legal tyres and exhaust. All tests were recorded on road legal tyres in controlled conditions using a standard Ultima GTR720 and verified by an official from Datron Technology (Guinness World Records timekeepers) using Microsat GPS equipment. The Ultima GTR720 has also recorded the quickest ever road legal lap time around the Top Gear Test Track at 1 min 12.8 secs, albeit unofficially but with an independent timekeeper and GPS timing gear present. The vehicle was also driven to and from the test track on the public roads as proof of its road going ability. The same Ultima GTR720 also recorded an even quicker Top Gear Test Track lap time of 1 min 9.9 secs but this time fitted with slick racing tyres to eclipse the 1 min 10.7 secs lap time of Michael Schumacher in his $1.8 million Ferrari FXX track car. It has been suggested that with the substantial upgrades, the Ultima Evolution may go from 0-60 mph in 2.3 seconds, 0-100 mph in 4.9s, and 0-100 mph-0 in 8.8s. ↑ Jan, Melin. "Bilen som slår alla rekord" Ny Teknik, 10 April 2015. Accessed: 11 April 2015. Wikimedia Commons has media related to Ultima vehicles.